The Vaka Fa'aola Pacific Focus Unit at Spring Hill Corrections Facility recently held an open day. Moana Tipa, Prison Arts Advisor, Arts Access Aotearoa, was invited to attend the event and view the cultural arts programmes. In his speech of welcome at the open day, Prison Site Manager Gavin Dalziel affirmed the Department of Corrections’ “audacious” vision for the Pacific Focus Unit, now in its third year. 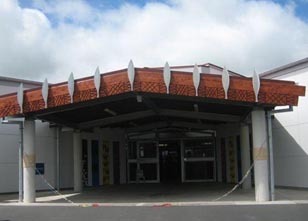 Vaka Fa’aola, he said, is the only prison-based Fale in the western world -- designed to enable programmes appropriate to the cultures of the Pacific to be delivered to Pacific prisoner populations. The programmes are centred around strengthening the cultural roots and heritage that help Pacific prisoners rehabilitate to life outside the prison. Intrinsic in this work are the relationships of service providers; the Church and specified community visitors such as Fautua Pasefika, and volunteers from local Pacific communities who play a vital role in addressing the cultural, spiritual, religious and other special needs of Pacific prisoner populations. They also advocate on behalf of Pacific families and communities to the Minister of Corrections and the Department. On the open day about 200 guests experienced work in progress at the unit. The Reverend Paulo Ieli used the analogy of transplanting plants from one environment to another to explain the nature of the work carried out. “When you’re taking a plant out of its own earth and transplanting it into a totally different environment with different sets of nutrients, it will survive only if its roots are strong enough and it has a measure of its own earth around it as it transplants,” he said. The open day began with the unveiling of a long carved wooden and metal sculpture by artist Fonofale McCarthy that sits over the entrance. Patterns in the wood carvings were designed by prisoners at the Vaka Fa’aola PFU. Stalls featured the crafts of prisoners and a permanent exhibition of acrylic paintings of different Island nations to be viewed in the visits room. In the cultural performance of prisoners attending the newly developed Pasefika programmes, visitors saw something of the extraordinary art form of ancient song and performance that undoubtedly touches into and strengthens roots of Polynesian identity. Last-minute preparations before the formal opening included final touches to the generous Pacific traditional delicacies supplied by the Pacific Island staff network. Some were assembled by Corrections Inmate Employment teams. Residential Manager Talaoalii Junior Ahyu and his staff maintained an air of order in the atmosphere of celebration. Staff were dressed in Island style civvies to blend easily into the occasion. Prisoners wore new identifying lavalava-style uniforms. Polynesia art creation tutor and artist Mary Ama and a number of weavers whipped up an outstanding collection of man-size flower arrangements of nikau and harakeke. Pacific drumming picked up momentum and pierced the air. In the Fale alongside, Church elders, community leaders, volunteers, stakeholders, guests and fanau were greeted with lei made of sweets and secured with fine ribbons. Dozens of people worked to bring the event together. The sense of community was pervasive. Like a village preparing to receive its guests for a traditional so’o (covenant of village friendship) there was a sense of belonging and being part of. The aiga/fanau concept adopted by the Pacific Focus Unit involves the active participation of families, Pacific community service providers and the Church. Their core statement is: O le tagata ma lona aiga, o le tagata ma lona fa’asinomaga - every person belongs to an aiga/fanau and every aiga/fanau belongs to a person. At the centre of the day’s orchestration was Le’aufa’amulia (Le’au) Asenati Lole-Taylor, Regional Advisor Pacific, Northern Region. She introduced the day and its officials, then, using a game of numbers to align each visitor with numbered security teams, made the crowd immediately at ease in the environment. Pacific life and expression draws from a deeply rich vein that undergirds and permeates daily life. Visitors to the open day experienced something of this in the art forms that are still relatively unknown in western cultural tradition. This was particularly evident in the Pasefika Legends (story telling) and Malaga Polenesia (Polynesian Journey) programmes -- delivered as constructive activities. Pasefika Legends focuses on ancestral histories and requires participants to explore the art of Pacific aristocrat communication and chief oratory language through storytelling and the use of ancestral languages. Malaga Polenesia is a more comprehensive work that can be applied to Samoan, Tongan, Niue and other island nations. It offers mentoring in cultural knowledge and histories. Some of these include lauga, the oratory involving tonal sound and body language and the dance art form siva and pesepesega - songs and lyrics that illustrate performance. These art forms are extraordinary. They engage and enter the deep creative vein, literally re-building what can be re-built and reviving the cultural spirits that Pacific prisoners may have neglected. Coupled with the faith of these island nations and the communities of volunteers alongside, the Pacific Island model of rehabilitation is as was stated at the start of the day – “audacious”. But they might argue that and say ‘it’s just what we do’. Original generation time 1.4418 seconds. Cache Loaded in: 0.0005 seconds.